Thanksgiving is upon us and this is surely the best time of year for rosé -- What, in the autumn?? As it's getting cold and we're eating roast veg, game, and preserves?? -- Yes. This is when great rosé is at its best. Many people incorrectly think of rosé only as a cheap semi sweet wine, like White Zinfandel; or as something pink, crisp, and ideal only for summer drinking on patios in the heat. Which it definitely is good for, but I'd argue that the best time of year to enjoy great rosé is in the fall amidst thanksgiving-like feasts when we're eating turkey, sweet potatoes, roast beets, cranberry sauce, etc. What is a better pairing for these dishes than a high quality rosé? Maybe Champagne or a good Burgundy? Otherwise, nothing. 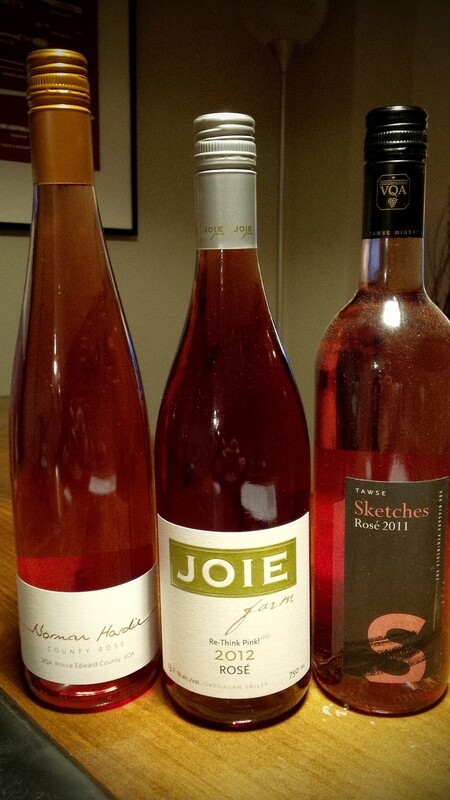 Rosé is one of the flagship wines by Joie Farm on the Naramata Bench in the Okanagan. This means they grow these red varietals specifically for the rose, it's not a 2ndary wine with juice left over from a red wine. The makeup is 60% Pinot Noir, 30% Gamay, 5% Pinot Meunier, 5% Pinot Gris. I've loved this wine so much in the past, last year I went to help make it and lived with Heidi and Michael for a week, an unforgettable experience that I can recall everytime I crack a bottle of the 2012! Here's my post from last year on harvest at Joie Farm. Their Rose is available online at Lifford Wine. Last year was my 'year of rosé', in that I helped make two great roses on different sides of the country. Before taking off to BC for two weeks of crush, I spent every weekend at Norman Hardie's in Prince Edward County and took the lead on producing his first rosé. It's 100% County Pinot Noir and we wanted to make something light, dry and a bit earthy...almost an oyster rosé if you will. And it certainly became that. Here's my post from making this rosé last year at Norm's. There is very little of this wine left, but if you're near The County you can pick some up at the cellar door for $20/bottle. Tawse has been named Winery of The Year three times in a row for a very good reason. Their best wines are epic and even their least expensive wines still get top accolades from writers and restaurants. Their 'Sketches' Rosé is a really interesting blend of Cabernet Franc, Gamay, Cabernet Sauvignon, Zweigelt, Pinot Noir, Gewurztraminer, Sauvignon Blanc, Semillon, and Pinot Gris! A dry wine, but with lots of fruit character and an excellent expression of Niagara. This one is available at the LCBO for $15.95. There you have it, my three favourite rosés from British Columbia, Prince Edward County and Niagara. Give rosé a try with your Thanksgiving feast!